Here’s what you can expect from my bi-weekly newsletter. You can expect at least one short, original article in every edition, probably on one of those topics or something related. I will also provide some curated content – the Best of the Blog section of each email. 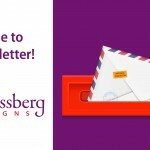 This curated content will be similar to what you’ve been seeing on the Kim Schlossberg Designs Facebook page for at least the past seven years. Thank you to all of you who have been following and participating on that page. It’s not going away. Facebook provides a simple way for me to share the many interesting stories I find throughout my day. But as followers will know, Facebook has gotten really stingy when it comes to sharing our content. I can understand why they want to push us to paid advertising, of course. But as popular as it has been, it doesn’t make sense for me to pay them to promote the Color Thesaurus. I will take the opportunity to share some of the best curated content in the biweekly newsletter. Coming up in the next edition: Maximum Impact Content Marketing. This is my plan for both the writer and the reader to get the best return on the investment of time devoted to an article. I hope you enjoy the bi-weekly newsletter in the coming weeks and months. Please share anything your friends might find useful or entertaining. I’d love to hear your comments and feedback.